For me, baking equals love. When I bake cookies, or a cake, or a loaf of bread, not only am I expressing love, I get a good deal of love in return. And despite having never won a ribbon in competition or testing my skills on a reality show, I know that I am a relatively skilled home baker. For the most part, the breads and sweets that come from my kitchen taste yummy, look pretty good, and certainly don’t last long. I love making cakes and cookies for friends, family, and coworkers who never fail to appreciate the effort; and I am happy to share my recipes when asked. Having said this, I would like to be an even better baker. To do this, the first step will be to review my own skills and equipment. I am sure my skills could use some tightening up, and my equipment and supplies could use some freshening. This first step may be beneficial to anyone just starting out, and for more experienced bakers, I will share some of the advice I intend to test while working on taking my own baking to the next level. From my childhood, I have fond memories of three particular cookies. One of my grandmothers kept Pepperidge Farm ginger man cookies in her freezer. I loved these cold, snappy cookies that came in pleated paper cups, encrusted with crunchy sugar crystals. I think she kept them in the freezer so they wouldn’t pass their expiration date; somehow she could make one small package of cookies last for weeks. My other grandmother was one of the first on the bandwagon to buy logs of slice-and-bake cookie dough. Voilà, “homemade” cookies. Fortunately, that option has improved somewhat, but in her cookie-making heyday, the taste of chocolate chips was always overpowered by the taste of preservatives. The third cookie came from my mom’s kitchen. Her oatmeal cut-out cookies are basically sugar cookies with oatmeal as the surprise ingredient. Mixed, rolled, cut in the shapes of the season, baked, frosted with rich, homemade butter cream frosting and decorated with sugars and candies, these cookies are unique and, quite simply, sublime. Several times a year, they are still made in my mom’s kitchen, my sister’s kitchen and my own kitchen. Disguised as a story of three cookies, this mini-history tells a bit of an evolutionary tale. While all cookies were eaten and appreciated, our evolution from manufactured, store-bought cookies, to factory-mixed dough, to all out, made-from-scratch cut-outs led me to the desire to find out what’s next. The first rule of baking is that baking requires discipline. If you have ever tried to go off-script with a recipe, you understand. For beginners and the somewhat more experienced, precise measuring and timing is required for successful results. Fortunately, there are thousands of recipes in cookbooks, recipe boxes, and online just waiting to be followed. Most have been tested to the point that, as long as you can read and follow directions, you can bake. Next, having the right equipment to follow those recipes is important. Two types of measuring cups are needed. The first is intended for measuring liquids, often comes with a pouring spout, and has clear measurements marked on the side. The second is intended for measuring dry ingredients. They tend to come without spouts, are individually sized, and have flat rims, making it easier to level the flour, sugar or oatmeal. Measuring spoons that are easily leveled on the side of a jar or with a knife are needed as well. Next, cookie sheets, loaf pans, and cake pans are available in many different materials. The key is finding ones you like, based on the size you require and their ease of handling. From experience, non-stick pans fail more than they succeed. Take the time to line cookie sheets with parchment paper or prepare pans according to the recipe’s instructions. You will also need a rubber (or silicone) spatula for scraping all the goodies from the side of the mixing bowl, a regular spatula for removing hot, goodies from their tray or pan, and a cooling rack. You may also need a whisk to pull together glazes and drizzles and, of course, a large mixing bowl. I prefer a very large, inexpensive stainless steel bowl, but glass works well too. 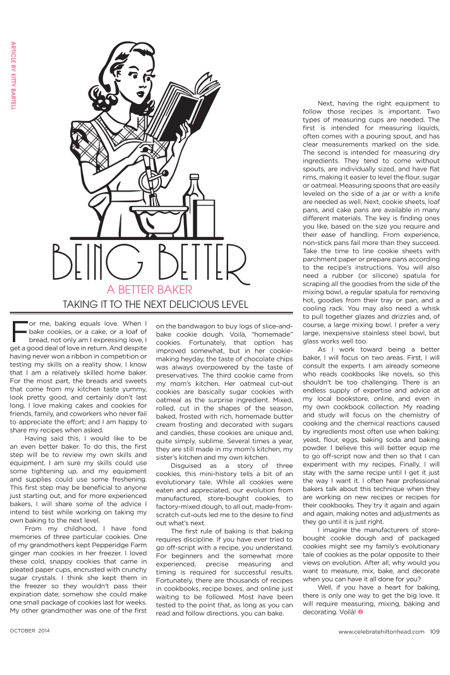 As I work toward being a better baker, I will focus on two areas. First, I will consult the experts. I am already someone who reads cookbooks like novels, so this shouldn’t be too challenging. There is an endless supply of expertise and advice at my local bookstore, online, and even in my own cookbook collection. My reading and study will focus on the chemistry of cooking and the chemical reactions caused by ingredients most often use when baking: yeast, flour, eggs, baking soda and baking powder. I believe this will better equip me to go off-script now and then so that I can experiment with my recipes. Finally, I will stay with the same recipe until I get it just the way I want it. I often hear professional bakers talk about this technique when they are working on new recipes or recipes for their cookbooks. They try it again and again and again, making notes and adjustments as they go until it is just right. I imagine the manufacturers of store-bought cookie dough and of packaged cookies might see my family’s evolutionary tale of cookies as the polar opposite to their views on evolution. After all, why would you want to measure, mix, bake, and decorate when you can have it all done for you?